The Nutcracker and the Four Realms may be a holiday movie, but it is too good to relegate to December viewings. At the beginning of the movie, all Clara (Mackenzie Foy) wants is a key that will unlock a box that holds a priceless gift from her late mother. A golden thread, given to her at Drosselmeyer’s (Morgan Freeman) her godfather’s annual holiday party, leads her to the unknown key, which immediately disappears into a strange and mysterious magical world. It’s there that Clara gets introduced to a soldier named Phillip (Jayden Fowora-Knight), a gang of mice and the residents who live over three Realms: (Land of Snowflakes, Land of Flowers and Land of Sweets). Clara and Phillip must brave the Fourth Realm on their own, home to the ruler Mother Ginger (Helen Mirren), to find Clara’s key and hopefully return peace to the unsteady world. 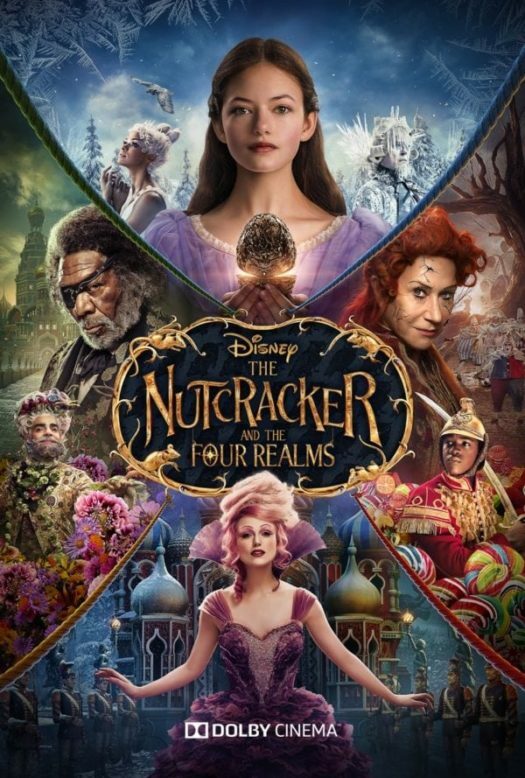 The Nutcracker and the Four Realms creates magical scenes that would amaze audiences and bring them into the mystical world. There is potential in this movie for a very distinct female lead role to take charge and really lead. The idea for a young girl to be interested in engineering and be the lead of this movie is very intriguing. Disney took an old movie and put a new and interesting twist on the plot. This movie is one that will bring the feel of the holidays back at any time of year.